James Tissot (1836–1902), Jesus Before Pilate, First Interview (1886-1894), opaque watercolor over graphite on gray wove paper, 16.8 x 28.6 cm, Brooklyn Museum, New York, NY. Courtesy of Brooklyn Museum, via Wikimedia Commons. 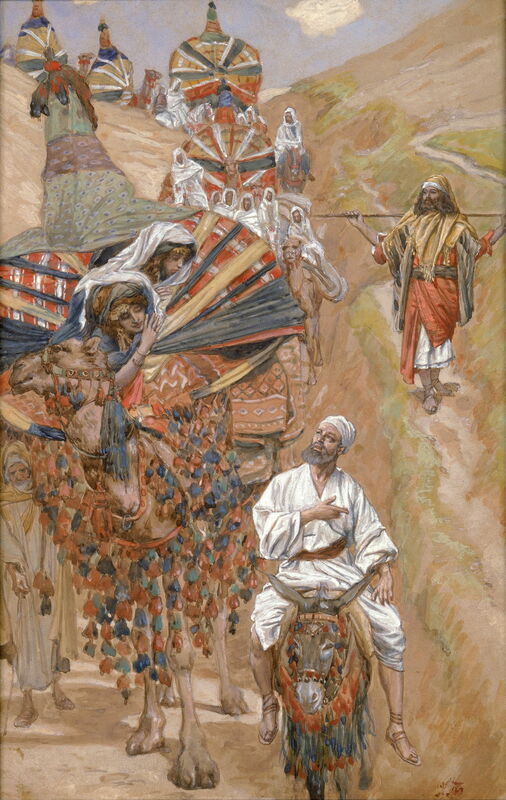 In the previous article, I explained how James Tissot’s (1836–1902) extraordinary series of paintings of Biblical stories came about, how he created them, and considered whether they are ‘mere’ illustrations or narrative paintings. Here I will provide examples of some of my favourites, both from his original series on the life of Jesus, and his final works showing stories from the Old Testament. 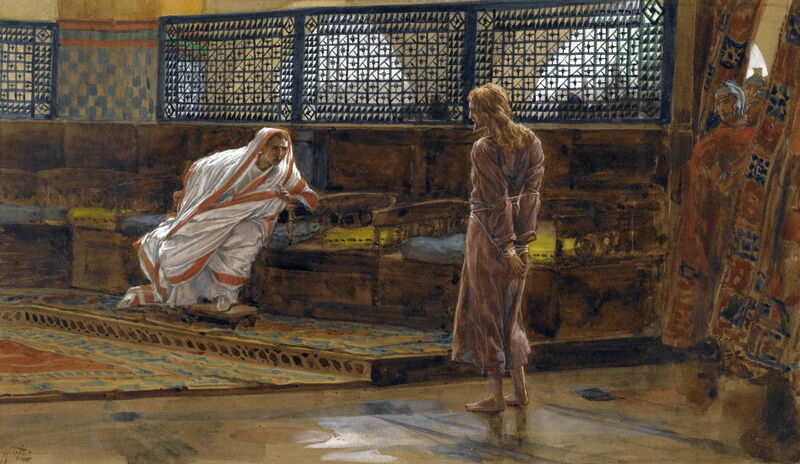 James Tissot (1836–1902), Jesus Found in the Temple (1886-1894), opaque watercolor over graphite on gray wove paper, 25.7 × 17.6 cm, Brooklyn Museum, New York, NY. Courtesy of Brooklyn Museum, via Wikimedia Commons. His paintings of the early life of Jesus are not particularly special, and most show motifs which have already featured extensively in paintings. However, Jesus Found in the Temple, showing the story from Luke 2:41-52, is rather different. When only twelve, Jesus was taken to the Temple in Jerusalem by his extended family at Passover. When the time came to return, he lingered there, and his absence was not noticed by the party during their return. Mary and Joseph went back to the Temple to find him in discussion with the elders, which was precocious, and resulted in his first claim that he was the son of God. Throughout this series, Tissot portrays Jesus Christ not as some superhero, but with his aim of educating and clarifying, shows him in keeping with his teaching. Here the young Jesus reveals his ultimate fate of crucifixion too, a good narrative device. James Tissot (1836–1902), The Foolish Virgins (1886-1894), opaque watercolor over graphite on gray wove paper, 18.1 × 26.4 cm, Brooklyn Museum, New York, NY. Courtesy of Brooklyn Museum, via Wikimedia Commons. After his paintings of the birth and early life of Christ, Tissot shows many episodes from his ministry. Although as I have shown some of these are less narrative than others, some of his paintings of parables, in particular, succeed well. The Foolish Virgins is one of a pair showing the parable of the Ten Virgins, told in Matthew 25:1-13. Five of the virgins, probably bridesmaids, are wise and have brought oil for the lamps which they carry, but five have only brought the lamps, so by the time the bridegroom arrives at midnight, their lamps have run out of oil and gone out. You can almost hear the young women chattering and laughing here, although this painting is not self-contained in its narrative. James Tissot (1836–1902), Jesus Chases a Possessed Man from the Synagogue (1886-1894), opaque watercolor over graphite on gray wove paper, 23.3 × 18.1 cm, Brooklyn Museum, New York, NY. Courtesy of Brooklyn Museum, via Wikimedia Commons. 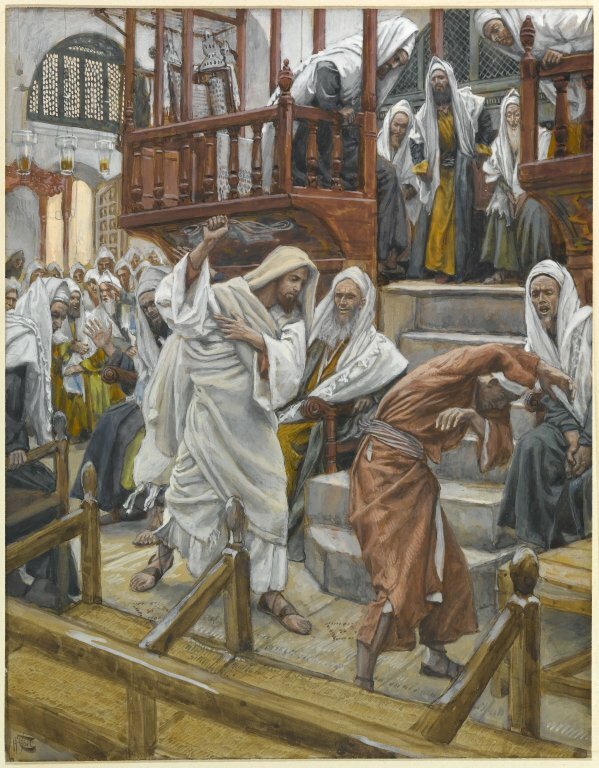 Another scene set in a synagogue, Jesus Chases a Possessed Man from the Synagogue is based on the story in Luke 4:33-35, in which he casts out a daemon possessing a man in the synagogue. Tissot complies with Alberti’s rules with some wonderful facial expressions, and clear body language, to tell this story well. James Tissot (1836–1902), Jesus Preaches in a Ship (1886-1894), opaque watercolor over graphite on gray wove paper, 16.2 × 21.1 cm, Brooklyn Museum, New York, NY. Courtesy of Brooklyn Museum, via Wikimedia Commons. 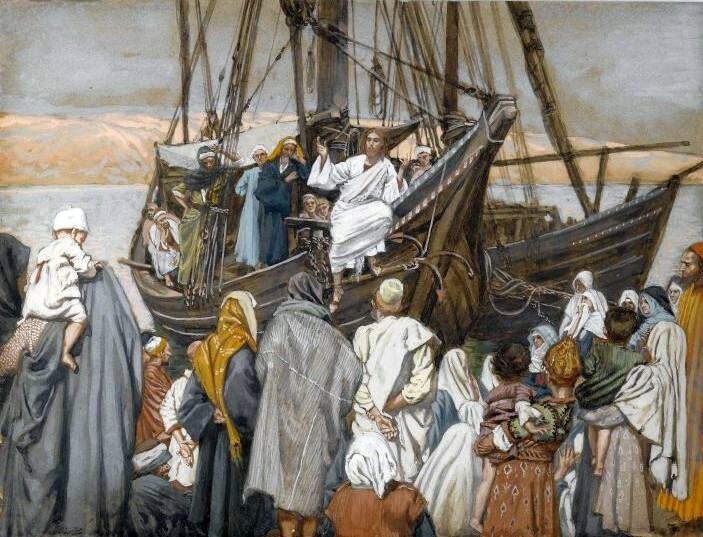 With Tissot’s maritime origins and years painting waterside scenes on the River Thames in London, paintings such as Jesus Preaches in a Ship have a strong air of authenticity, within the knowledge of the time. This may well refer to Matthew 13:1-9 or its equivalents in the other Gospels, although it is more of a tableau than narrative. James Tissot (1836–1902), The Return of the Prodigal Son (1886-1894), opaque watercolor over graphite on gray wove paper, 22.1 × 14 cm, Brooklyn Museum, New York, NY. Courtesy of Brooklyn Museum, via Wikimedia Commons. 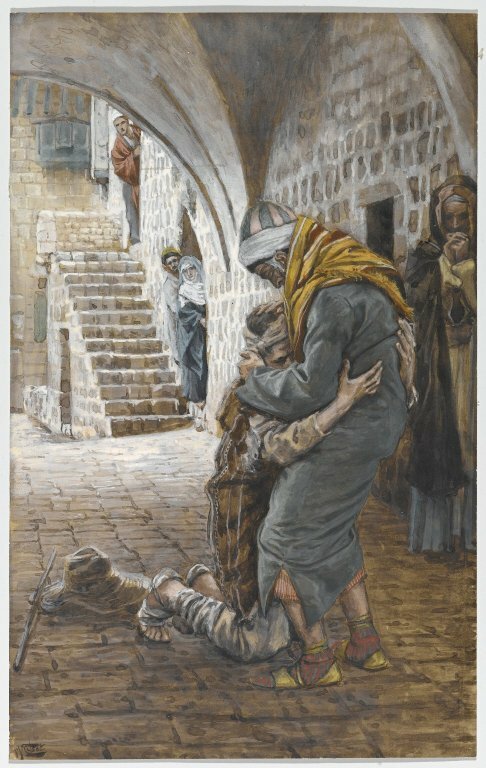 Having already created two oil paintings of this scene transposed to more modern times, The Return of the Prodigal Son is Tissot’s third and final version, telling part of the story in Luke 15:11-32. As in the previous paintings, he opts not to show this literally – the Gospel account setting this moment out on the road, where the prodigal son’s father finds him – but in one of his carefully sketched and drawn urban settings. Despite the faces of father and son being almost obscured, Tissot carries this off well. 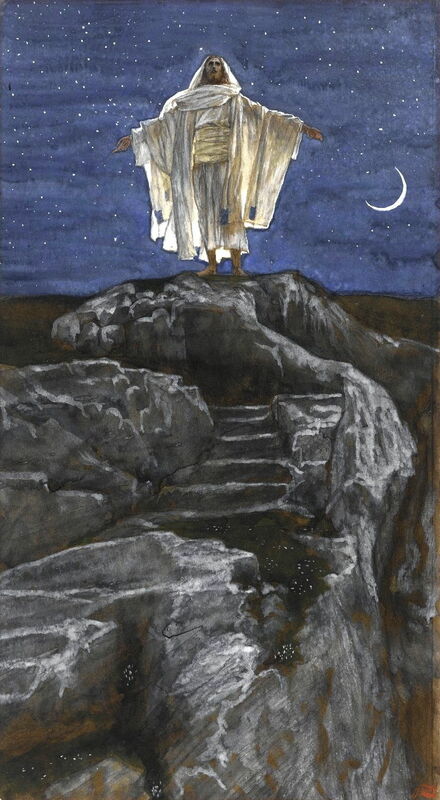 James Tissot (1836-1902), Jesus Goes Up Alone onto a Mountain to Pray (1886-1894), opaque watercolor over graphite on gray wove paper, 28.9 × 15.9 cm, Brooklyn Museum, New York, NY. Courtesy of Brooklyn Museum, via Wikimedia Commons. One of his most moving and spectacular paintings in the series is Jesus Goes Up Alone onto a Mountain to Pray, based on Matthew 14:23. It is almost non-narrative, though. James Tissot (1836–1902), The Transfiguration (1886-1894), opaque watercolor over graphite on gray wove paper, 24.1 × 15.4 cm, Brooklyn Museum, New York, NY. Courtesy of Brooklyn Museum, via Wikimedia Commons. 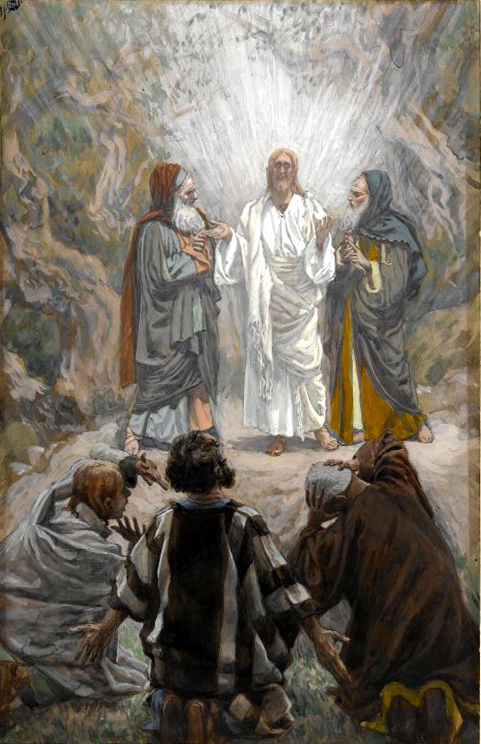 The Transfiguration shows the episode reported in Matthew 17:1–9 (and its equivalents), in which Jesus went to a mountain with three of his apostles, Peter, James, and John. There Jesus appears in bright rays of light, and the Old Testament prophets Moses and Elijah appear beside him. God’s voice then identifies Jesus as his son. 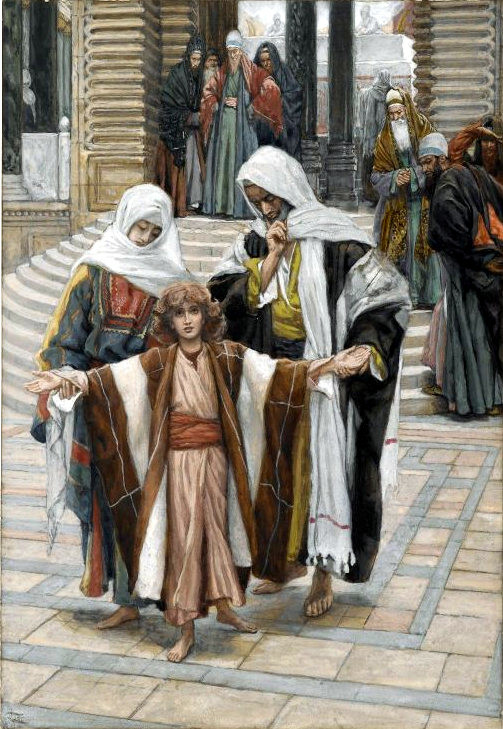 A popular scene among those painting religious works, Tissot’s painting is both accurate and successful, although it too has been criticised for its ‘weak’ depiction of Jesus. 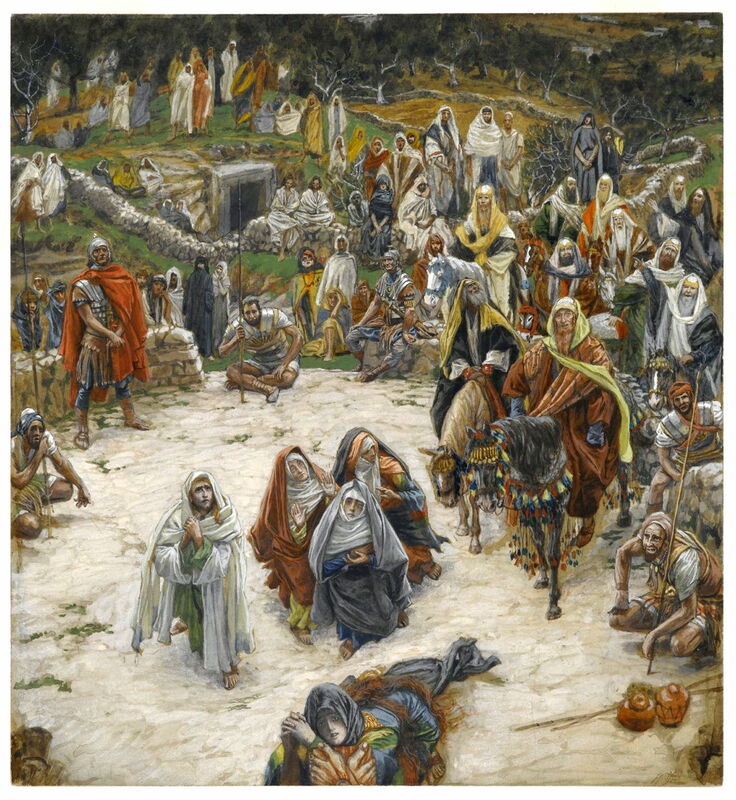 Following his paintings of Christ’s ministry, Tissot moves on to show the Passion in great, and sometimes graphic, detail. Here are some of his most successful and most narrative works in the series. Jesus Before Pilate, First Interview shows the episode from Luke 23:1-4 and John 18:33-38 in which Pilate, the Roman governor at the time, questions Jesus and concludes that there is no basis for any charge against him. Technically one of the most brilliant paintings of the series, it is easy to mistake this for being painted in oils, and this is probably his most convincing depiction of Jesus. As narrative it is not particularly strong, though, lacking reference to the immediate or eventual outcome. 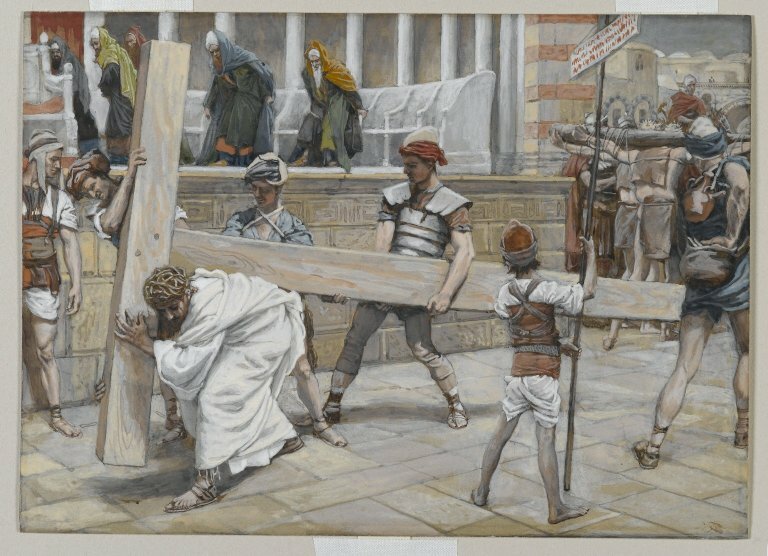 James Tissot (1836–1902), Jesus Bearing the Cross (1886-1894), opaque watercolor over graphite on gray wove paper, 17.5 × 24.3 cm, Brooklyn Museum, New York, NY. Courtesy of Brooklyn Museum, via Wikimedia Commons. Jesus Bearing the Cross shows a generally popular scene during the Passion, referring for example to John 19:17. Compare the detailed accounts given in my articles about Bosch’s paintings here and here. James Tissot (1836-1902), What Our Lord Saw from the Cross (1886-1894), opaque watercolor over graphite on gray-green wove paper, 24.8 × 23 cm, Brooklyn Museum, New York, NY. Courtesy of Brooklyn Museum, via Wikimedia Commons. 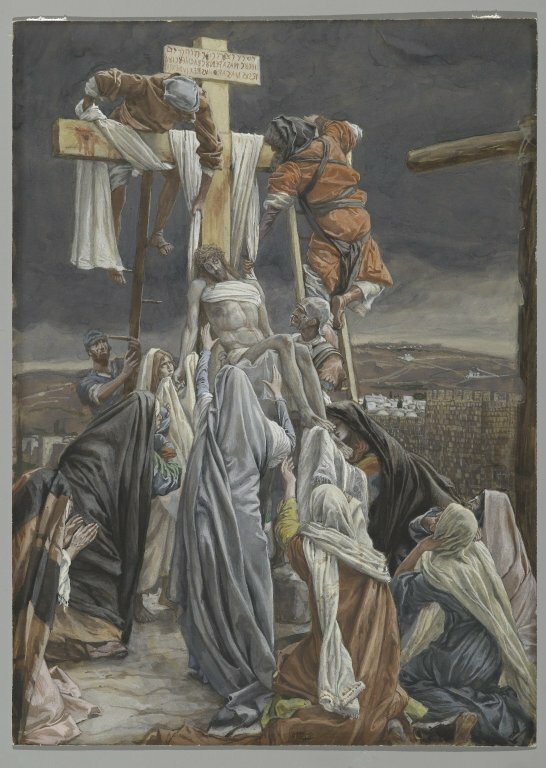 What Our Lord Saw from the Cross is one of the most remarkable paintings from the series, which features many views of Christ on the cross from the ground. Although a very different view, it is as unconventional and innovative as Salvador Dalí’s Christ of Saint John of the Cross (1951), and in pursuit of Tissot’s aim to educate by giving the viewer what appears to be first-hand experience of these scenes. 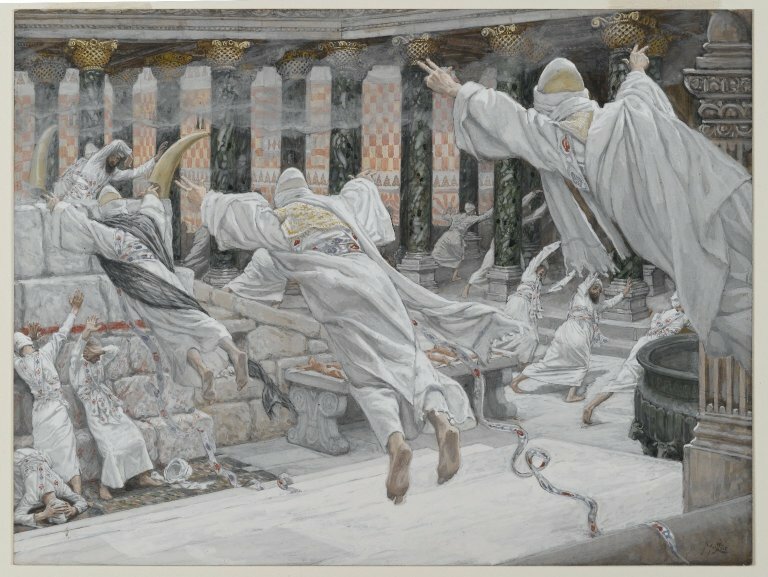 James Tissot (1836–1902), The Dead Appear in the Temple (1886-1894), opaque watercolor over graphite on gray wove paper, 21.4 × 28.4 cm, Brooklyn Museum, New York, NY. Courtesy of Brooklyn Museum, via Wikimedia Commons. During the crucifixion, various portentous events happened throughout Jerusalem, including an earthquake and The Dead Appear in the Temple, described in Matthew 27:52-53 and shown very clearly here. Tissot’s book contains extensive drawings and notes detailing his concepts of the Temple, as part of his aim to educate and inform. James Tissot (1836–1902), The Descent from the Cross (1886-1894), opaque watercolor over graphite on gray wove paper, 33.7 × 24.3 cm, Brooklyn Museum, New York, NY. Courtesy of Brooklyn Museum, via Wikimedia Commons. My final choice from this series is his The Descent from the Cross or The Deposition, for centuries a very popular motif for paintings, in which Christ’s body is taken down from the cross after his death, and removed for burial. With so many Masters before him, Tissot was spoilt for choice as to how he depicted this, and seems to have been inspired mainly by Rubens’ version from 1617-18, arguably the most famous of all. Unlike Rubens, he ensures that most of the faces are not visible, which ingeniously dodges arguments about who actually was present at the time: John 19:38-42, for instance, only identifies Joseph of Arimathea and Nicodemus, and the Gospel accounts mention an undefined number of women, including Mary Salome, the Virgin Mary, and Mary Magdalene. 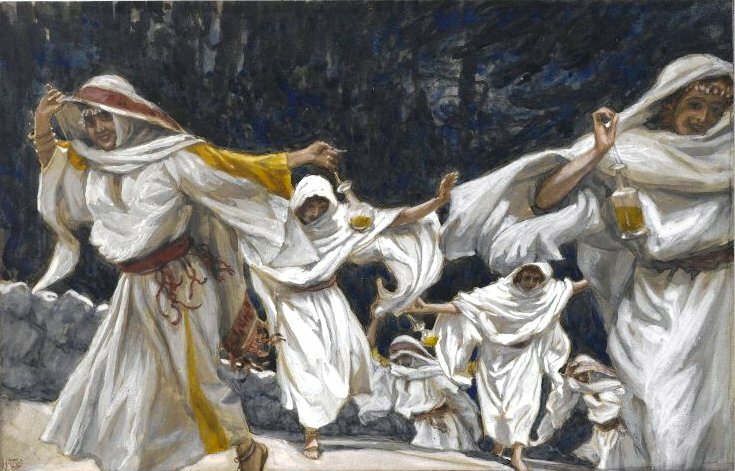 Once he had completed the 350 or so paintings of the life of Jesus, Tissot moved on to paint scenes from the Old Testament, intending to repeat his success. Sadly he died suddenly when he was only around halfway through that task. By that time, I think that the flashes of genius seen in some of the paintings in the first series were becoming even less frequent, and many of the Old Testament paintings seem more mechanical, even tired. James Tissot (1836-1902), Adam and Eve Driven From Paradise (c 1896-1902), gouache on board, 22.6 x 31.7 cm, The Jewish Museum, New York, NY. Wikimedia Commons. 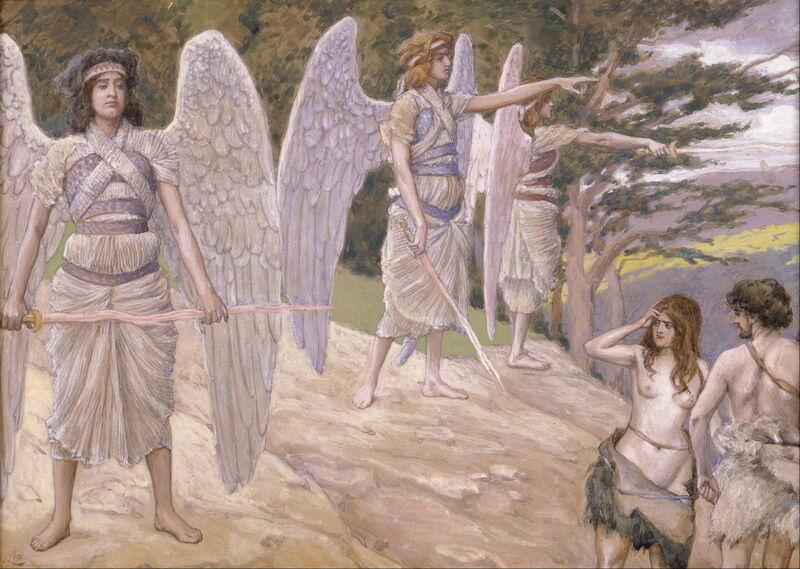 Adam and Eve Driven From Paradise is another very popular scene for paintings, and one of the better in Tissot’s series, although his depictions of Adam and Eve are far from conventional. James Tissot (1836–1902), Rebecca Meets Isaac by the Way (c 1896–1902), gouache on board, 189 cm × 296 cm, The Jewish Museum, New York, NY. Wikimedia Commons. Rebecca Meets Isaac by the Way is a wonderful depiction of the story in Genesis 24:63-65. Rebecca has been chosen to be Isaac’s bride, and is here travelling to join him. Isaac has been out in the fields meditating in the evening when he sees camels approaching, so rides over to greet them, meeting his bride for the first time. Thankfully, Tissot’s Biblical series have not gone the way of so many series in the past, and been scattered to the four corners of the globe. The complete series of the life of Jesus Christ was bought, following public subscription, by the Brooklyn Museum in New York, and the completed paintings of the Old Testament series have made their way into the Jewish Museum, also in New York. English translation of Tissot’ book, fully illustrated: volume 1, volume 2. Dolkart JF (ed) (2009) James Tissot, the Life of Christ, Brooklyn Museum and Merrell. ISBN 978 1 8589 4496 8. Marshall NR & Warner M (1999) James Tissot, Victorian Life / Modern Love, Yale UP. ISBN 978 0 300 08173 2. Wood C (1986) Tissot, Weidenfeld and Nicolson. ISBN 978 0 297 79475 2. Posted in General, Painting and tagged Bosch, Dalí, narrative, painting, Rubens, Tissot. Bookmark the permalink.